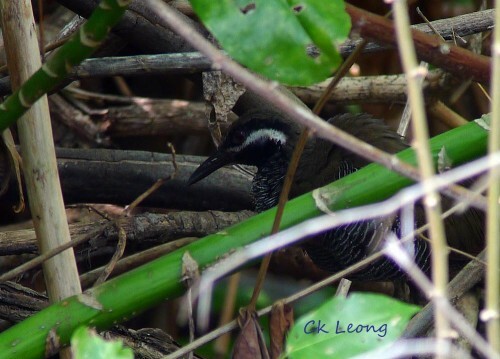 I was first alerted to the presence of the Barred Rail Gallirallus torquatus as a new addition to the Bornean bird list by Michael & Marilyn Burge who went on holiday to Pom Pom island near Semporna in February 2010 and came away with videos and photos of this bird. I had always wanted to go and see this bird for myself even though it would have been a long trip for me to get to the island. Since then this bird has turned up on Selingan island, one of the Turtle islands near to Sandakan. Lady luck was with me when my friend Osman Assan was able to arrange for me to go to Selingan (May 29, 2013). The island is quite small, about 7.2 hecatares, little vegetation, and it took us only a few minutes to find the bird. I was also happy to note that there were 2 pairs of the bird on the island. Selingan island is one of 3 islands of the Turtle Island Park which boasts of one of the longest green turtle conservation history in the world. Birders will also find that the Tabon Scrubfowl is easily seen here. The Barred Rail is also my 500th bird for my Bornean list. A really nice addition. The White-breasted Waterhen Amaurornis phoenicurus is a common rail in Borneo, found in a wide variety of habitat from padi fields to swamps to plantations. It is actually a very handsome bird worthy of greater attention. It has a series of wierd calls and this is also reflected in its local name Ruak-ruak. 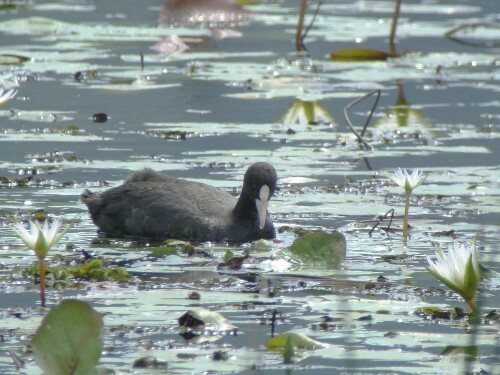 Last month while birding in Nepal, the Common Coot Fulica atra was a common bird in ponds and rivers. At the Phewa Lake in Porkara, congregations in the hundreds were sighted daily. This morning at a little swamp south of Kota Kinabalu, I was looking at the same bird. It was only after a while that it occurred to me that the Common Coot was a rare vagrant in Borneo. What extraordinary luck! I had stopped there to take some pictures of the Wandering Whistling Duck, a common species here. There was only 1 Coot that I saw and it was an immature with the frontal shield yet to be fully developed. 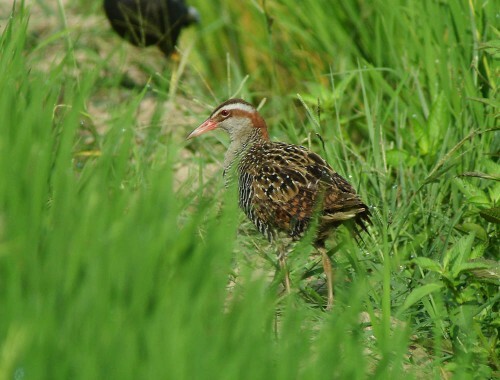 It was two years ago today when my friend and bird photographer Karim Madoya took photos of the first Buff-banded Rail Gallirallus philippensis in Borneo. 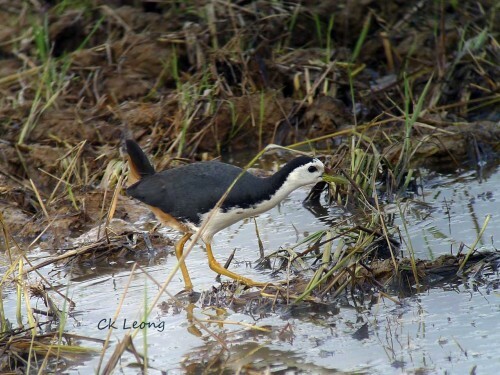 Since then this illusive bird has been seen on different occasions by local birders, most recently in the paddy fields of Penampang near Kota Kinabalu. The birds we saw were typically secretive, appearing only during dawn and dusk. However luck was with me with this very confiding bird, preening itself after having taken a dip in the nearby pool. I must say it is a most welcomed addition to the birds of Borneo. This morning’s trip to the paddy fields of Kota Belud produced a pleasant surprise – a whole party of feeding swamphens, something which I had previously witnessed only in India. 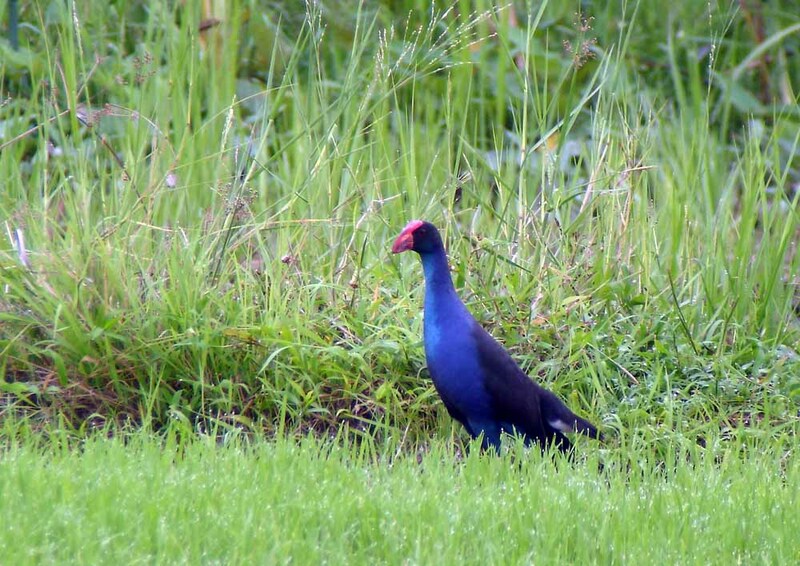 We saw about 10 Black-backed Swamphen Porphyrio indicus with at least 1 juvenile from our spot at the side of the road. The birds were constantly on the move, flicking their tails at the same time. Once only known from south Borneo, their spread has been quite remarkable. Not that I am complaining.